As promised, here is the third installment of the series based upon Dorothea’s Brande’s recommendations on how writers can write effortlessly and how they can carve out more writing time for themselves. Her suggestions for writers include early morning writing and writing by prearrangement. 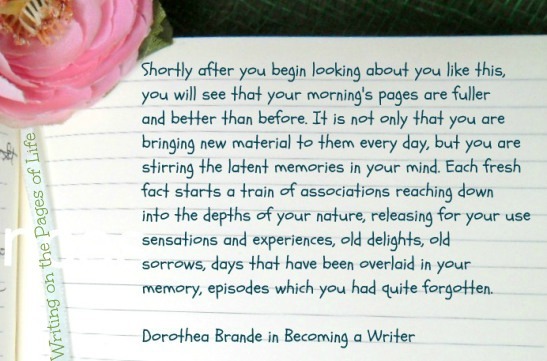 After one has practiced both for some time, Brande assures the writer that s/he will reap many rewards from the faithful practice of writing first thing in the morning and making appointments with one’s self to write. When you have succeeded in establishing these two habits — early morning writing and writing by agreement with yourself — you have com a long way on the writer’s path. You have gained, on the one had, fluency, and on the other control, even though in an elementary way. You know a great deal more about yourself, in all likelihood, than you did when you embarked on the exercises. For one thing, you know whether it is easier to teach yourself to write on and on and on, or whether writing by prearrangement seemed more natural. Perhaps for the first time you see that if you want to write you can write, and that no life is actually so busy as to offer no opportunities if you are alert to find them. Then, too, you should begin to think it less than miraculous that writers can bring out book after book, having found in yourself the same inexhaustible resources that issue in the work of others. The physical mechanism of writing should have ceased to be tiring and begun to take its place as a simple activity. Your realization of the writer’s life is probably more vivid and nearer to the truth than it was before — which is in itself a long stride to have taken. I have been doing early morning writing for several weeks now, and so far, I don’t find it difficult at all. It’s on my mind after I get up from bed. The “empty” state of the mind is not a problem because a word, a phrase, and then a sentence come flowing once I set my pen on the paper, poised to begin the day with a few writing moments. On some days the first few words lead to a continuous stream of thoughts on the same issue or subject matter. Sometimes though, I start out writing about one thing and then lead on to another topic. The process is completely stress-free because on days when I’m rushed (usually when I wake up late), I know that I can close the notebook even if I had just written on one page. There have been days though that I got completely lost in the writing process, which have resulted in entries more than five pages long. As for writing by prearrangement, I can say that I am only mildly successful. I’m always late – by thirty minutes, sometimes by two hours. Still, I manage to carve out more writing time by making an appointment with myself. It’s not a good thing because I try my best to be on time for appointments with others. Like many people, I still tend to put myself last on the list, but I think I’m making progress because today I was late for only thirty minutes. The purpose of reading what we have written is to discover more about ourselves as a writer. When we read what we have written with a critical eye, the pages become our teachers. We then see ourselves as writers from the perspective of a critic – are we imitating the style of a particular writer? We also become aware of our strengths and weakness. We all live so surrounded by words that it is difficult for us to discover, without long experience, what our own rhythms are, and what subjects do really appeal to us. Those who are sensitive enough to want ardently to become writers are usually a little too suggestible for their own good. Consciously or not, they may have fallen into the temptation of imitating an established author. It may be a genuine master of writing; it may be (and too often is) the author whose work is having the greatest vogue at the moment. No one who has not taught fiction writing can believe how often a pupil will say such thing as, “Oh, I’ve just thought of the most marvelous Faulkner story!” or, more ambitiously, “I think I can make a regular Virginia Woolf out of it.” The teacher who crassly says she would rather see a good story of the pupil’s own is damned for a prig, or outspokenly argued with; for the notion that playing the sedulous ape to the extent of copying not only the prose style but the very philosophies and narrative forms of current popular authors seems to have been so inculcated in our apprentice writers that they genuinely believe they will become original authors by the process of imitation. The men and women who have served as their models since they are writing from a strong native talent and according to their own personal tastes, grow, alter, change their styles and their “formulas,” and the poor sedulous apes are left imitating the work of an outmoded period. The best way to escape the temptation to imitate is to discover as early as possible one’s own tastes and excellences. Here, in the sheaf of pages you have written during this period of habit-making, is priceless laboratory material for you. What, on the whole, do you write, when you set down the first things that occur to you? Try to read, now, as though you had the work of a stranger in your hands, and to discover there what the tastes and talents of this alien writer may be. Put aside every preconception about your work. Try to forget any ambitions or hopes or fears you may have entertained, and see what you would decide was the best field for this stranger if he were to consult you. The repetitions, the recurrent ideas, the frequent prose forms in these pages will give you your clues. They will show you where your native gift lies, whether or not you eventually decide to specialize in it. There is no reason to believe that you can write only one type of work, that you may not be fully as successful in some other line; but this examination will show you where your richest and most easily tapped vein lies. This certainly sounds like a lot of work, but I would certainly try it after I am able to come on time from my writing appointments. Although I know I was born to be a non-fiction writer, I am admittedly at a loss now as to what aspect of creative writing I should pursue. So far, I am learning so much from following Brande’s suggestions. I have no doubt that the answer to my dilemma lies on the pages I write early in the morning, and during my writing dates with myself. I hope that you’ll be able to squeeze in early morning writing while the kids and hubby are still sleeping. Happy writing! Never before have I realized how important early-morning writing can be; the subconscious mind is still fresh in the conscious. This is a great insight ! Thanks. I’m not a writer but have always wanted to be, more as a cathartic exercise than for anyone else’s benefit. But this approach, early writing, is necessary, I feel sure. I will apply your advice. I am a firm believer in writing as a way to heal one’s self. I wish you the best in your early morning writing! Good luck with your writing appointments with yourself, Renata! Thanks for the reblog…and keep writing! This is tremendously inspirational, so much that it gives me the nudge to do the same or at least to create some sort of self-discipline. I really like the idea of self-appointment to write, what a simple yet interesting idea. I think I always make excuses for a lot of things that I love to do… silly as it sounds, but that’s the truth. No quality time to do this or that, is my classic excuse. As if things need to be done at the “right time”… but the “right time” is mostly an illusion, if we think well. I’m really glad this post gave you the nudge you needed. Yes, the idea of making an appointment with ourselves to write sounds simple….and you’re not alone in making excuses! made just right content material as you probably did, the web can be much more useful than ever before.